We are saddened to announce the passing of longtime employee and friend of Hope International University, Dr. John Rowe. Dr. Rowe began serving HIU in 1967 and held a number of positions in his time here including Professor, Dean of Students, and Senior Advancement Officer. He was a friend and mentor to many, influencing the lives of generations of students, staff, faculty and members of our community. He passed away on April 7, 2014, just six weeks shy of his 85th birthday, but the effects of his ministry will be felt for many years to come. One of John Rowe"s earliest memories was talking to God in the parlor of his Grandpa Rowe"s farmhouse. As a youth, John talked to God through his music, when he became the church pianist at the Church of the Brethren in Dallas Center, Iowa. Later, he talked to congregations as a pastor, to students as a professor, and to troubled souls as a counselor. "John was HIU's "Renaissance Man,"" commented President John Derry. "There is not an area of campus where his presence has not been felt." 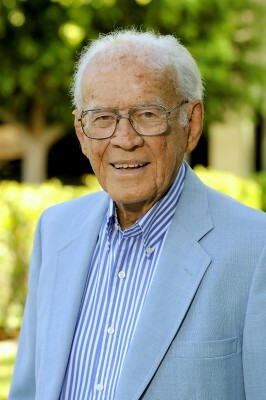 Dr. Rowe began his career at HIU when he and his wife, Katherine, moved to Long Beach in 1967. His positions of service also included a Professor of Preaching and Philosophy, Dean of Students, Athletic Director, Financial Aid Officer, and Housing and Food Services Manager. He wrote in his autobiographical notes that he believed the Lord brought him to HIU to work primarily with young preaching majors, because of his years of experience in various denominations and church-related organizations. He wrote with fondness of his work at HIU and the changes he had witnessed. Multiple generations of Hope International University alumni owe a debt of gratitude to Dr. Rowe for talk of another kind: the kind of talk that builds relationships and raises funds for a cause. "John Rowe was never afraid to ask a prospective donor to invest in HIU," said Vice President for Institutional Advancement Michael Mulryan. "He has played a significant role in the lives of our campus and students over the course of many decades." Dr. Rowe held a Bachelor of Arts degree in Preaching Ministry from Minnesota Bible College, and both Master of Divinity and Doctor of Ministry degrees from Vanderbilt University. He was licensed as a Counselor in Tennessee, Indiana, and Illinois, and served in the mental health field during the early 1960s, in addition to his work as a minister and a church musician. A memorial service for Dr. Rowe was held on Friday, April 25th in HIU's Pacific Auditorium. A video recording of the service is available at www.youtube.com/hiuniversity.